We may have lost all hope for a Beth and Daryl pairing in AMC’s The Walking Dead, but it turns out, fans of the zombie-fighting duo may be able to cheer for the pair in real life. The two actors who portrayed Beth and Daryl are apparently taking that on screen chemistry off screen, as reports flood in Norman Reedus and Emily Kinney are currently in a relationship. They had a connection early on in the show, but the romance developed recently. They’re still pretty guarded about it. The two have been seen out and about, and have chalked it up to being great friends—friendship that bloomed on set of The Walking Dead. But, now that Emily Kinney won’t be spending time on set with her former co-star, the two have been keeping in touch and hanging out in other environments. Most recently, Reedus was seen attending one of Kinney’s music gigs (she is also a musician). Apparently, Reedus was attending the concert when a few die-hard Walking Dead fans noticed the two and got awfully excited. And the two apparently were seen canoodling after Kinney's set as well. Everyone reached out, though I remember Norman texted me—he’s so sweet. While we are currently still sitting in rumorville, you have to admit the two do make quite the cute couple. Norman Reedus had his own hilarious response to the gossip though. Maybe Reedus is trying to divert attention, maybe the two really are just friends. 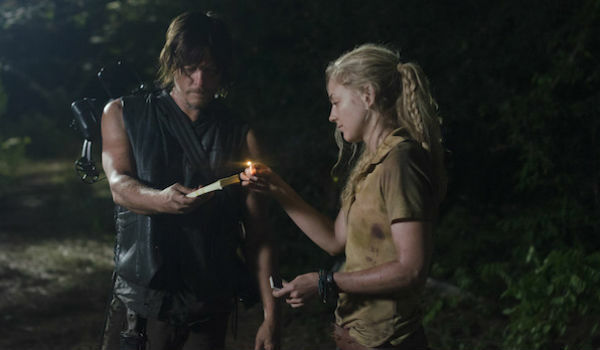 But if we can’t see Daryl and Beth finally make it together on screen, at least we can rest easy knowing there is some sort of relationship blossoming off.